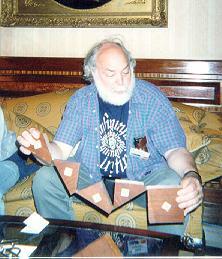 At IPP19 in August 1999, David Singmaster mentioned to me that about ten years earlier he had had a hinged model constructed of Henry Perigal's dissection of two squares to one. Since I was very interested, David, who lives in London, brought the model to the meeting the next day. 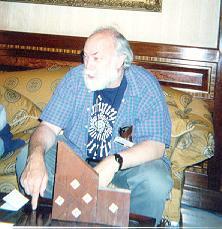 The pictures show him sitting in the lobby of the hotel and demonstrating his model. Whereas I would prefer to leave the small square separate, David had had all five pieces hinged together, as shown on the left above. The picture on the right shows the five pieces folded around so that they form the two small squares sitting side by side. David had also had a right triangle constructed whose sides are the sidelengths of the three squares, and he has placed this triangle on top of the medium size square. Interestingly, the ratio of sidelengths appears to be more or less the same as what is in the diagram on the south front of Henry Perigal's monument in the churchyard at Wennington. Copyright 1999, Greg N. Frederickson. Last updated February 5, 2001.